Luckily, I’m not, and it’s 2009. And I’m really happy about it! DS has had a low fever coming and going for the last few days. He is cranky, clingy and frankly unbearable, even though the doctor hasn’t found anything wrong with him and he has no other (physical) symptom. But even when we haven’t seen him smile for a week, he manages to make us laugh. I was fascinated when DS started trying to sing songs. It seems to me that you need to have a pretty good memory for a totally abstract concept in order to remember a song and sing it back. The first one he sang was Baby Beluga. These days, it’s “Puff… Dragon… Sea”. You recognize, of course, Puff the magic dragon. Last night, I was rocking him before bed time and he “sang” those words, so I sang the chorus to him. Then I stopped. He started talking again, and it took me two or three times to understand, but he kept repeating “Paper”. Yeah. “Little Jacky Paper loved that rascal Puff” is the following verse. That kinda blew me away. These days, Zak keeps singing a Stan Rogers song, “Barret’s Privateer”. In fact, he’s stuck on the first two lines, “Oh! The year was 1778, How I wish I was in Sherbrooke now”. Well now, when he says “Oh! The year was 1778″ and stops, DS says “I wish, I wish”. He’s not quite in tune, but he’s working on it! I think we have a singer in the house! Ever since I got pregnant we noticed how men are treated differently than women when it comes to anything regarding children. True, women still statistically take on more duties related to their children. Still, when a man wants to be involved in his child’s life, it can be frustrating to see how hard it is to be taken seriously. Already at my first ultrasound Zak was asked to remain in the waiting room while the technician took the measurements, then they would come and get him for the “here is the head and here are the feet” part. But that means I got to see the baby before he did. That means he was left behind. We knew it wouldn’t be the last time. The situation has become even more frustrating now that Zak is DS’s main caregiver. He signed up for some research about language development done at UBC. When they called to make an appointment, I had to repeat twice that it would be my husband going with our son, not me, before they realized that they were talking to the wrong person. When DS cried during his first swimming “lesson” and kept asking for Mommy, everyone gave him the “poor Dad who doesn’t know how to handle his baby” look. Nope. It was just that seeing me by the side of the pool without being able to go see me was too much for him after a whole week apart. The other day, Zak was at playtime with DS. A little girl the same age was following them around, which happens all the time, probably partly because he’s one of the only parent who actually plays with the kids instead of being there to socialize with other parents, and partly because a lot of these kids seem to miss their Daddy. The mother of the little girl came by, commented on how her daughter seemed to like Zak and introduced her to him. The little girl blew him a kiss. Zak blew a kiss back at her. The mom looked at him – pissed – and left, saying under her breath that this “was a bit much”. For a blown kiss. He didn’t touch her. He wasn’t even withing arm’s reach. He just responded to her lead. You think there’s any chance in hell the reaction would have been the same if it had been me blowing a kiss to a little boy? Yeah, right! Already, Zak had noticed some mothers getting antsy when their kids would come sit on his lap or hold on to him. What is he supposed to do? Stay ten feet away from any other human being? Just because he’s a man? I understand where they’re coming from, I know that we live in a big bad scary world (or at least that’s what you think if you watch too much TV), but still. Get a grip! Don’t teach your kids to stay away from every single male. Don’t raise your kids in fear. But I digress. This was supposed to be about sexism. Sorry! I am talking about the mouse, of course. The cat WAS invited in, and he seemed to think I was very cruel for noy allowing him OUT onto the balcony. 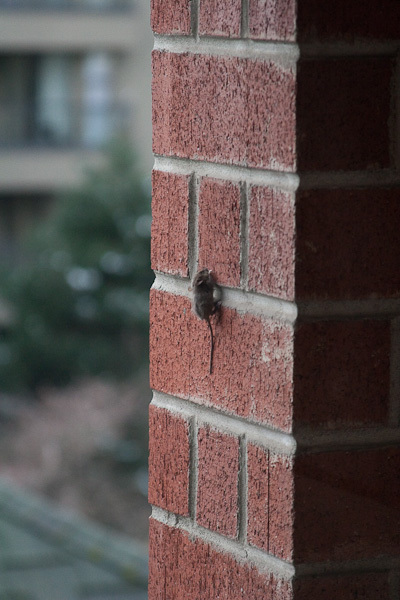 Now our balcony is on the third floor, so we were wondering how the mouse made it here, until it started walking up the brick wall like this was a regular Sunday morning walk. Not too much later, though, it fell to what we worried was its death. I mean, it’s three floors! But no, according to our neighbours, it was still alive when it landed in the courtyard. Although it was stunned, and as Zak so nicely observed, it may have been slowly dying from internal bleeding, for all we know. But we hope not. 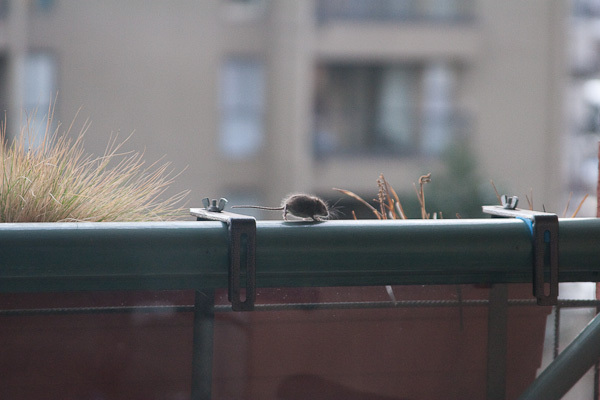 As much as I don’t really want a mouse on my balcony (or in my apartment, for all matter), we really enjoyed its visit. 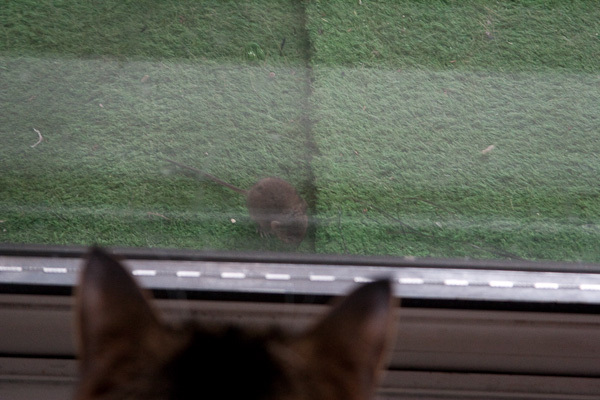 DS has been saying “mouse!” and the cat keeps pawing at the window. They are all hoping it comes back… Except for me. I’d rather watch it in the courtyard. Or at the pet store.